I have wanted to try my hand at making my own homemade chalky finish paint for quite awhile now and today’s project lent itself perfectly to experimenting with a homemade paint recipe. I am feverishly trying to get the entire house decorated for Christmas by this weekend and my mantel is of course a top priority! 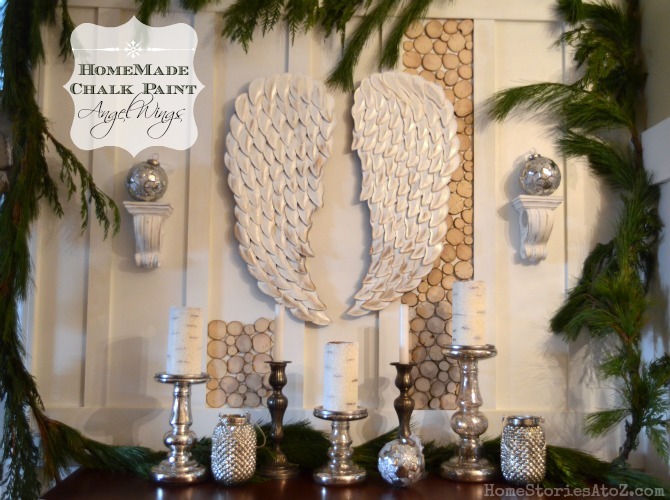 I used my homemade chalk paint recipe on the angel wings and they turned out exactly the way I hoped! But as you can see in the picture below, I have one project that is painfully not yet finished. Please try and pretend that that wall is done. Sometimes the show must go on with all of it’s imperfections and unfinished projects! I love Annie Sloan Chalk Paint and recommend using it. It’s fantastic to work with and the consistency is much better than homemade chalk paint. However, when in a pinch for time (or cost) this recipe should be in every DIY’ers arsenal of tricks. To make chalk paint all you need is unsanded grout which can be found in the tile section at Lowes and your choice of latex paint. Flat paint works best but whatever you have on hand will do! I used Valspar’s Paint & Primer Gloss in Brilliant White and it still worked but was more difficult to distress. The key to getting your chalk paint nice and smooth is to mix the grout with a small amount of water to make a smooth paste before adding your paint. Your paint will be thick but should NOT be lumpy at all. You can try my paint mixing technique to achieve a very smooth consistency. Homemade chalk paint dries very quickly, so you’ll want to work fast. The beautiful thing about it is that you can slap it on without much precision and it levels nicely. 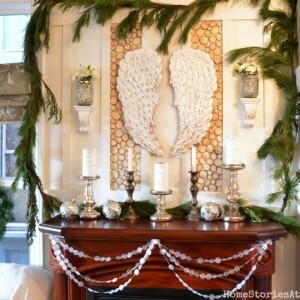 I knew that I wanted angel wings above my mantel this year. I had originally planned on making some by using cardboard for the base of the wings and cutting feathers from cereal boxes. But when I stumbled on these angel wings at Marshall’s for $14.99, I figured I’d save myself 15 hours of work and just paint them! After allowing my paint to dry (which didn’t take long), I distressed the edges of the wings with a sanding sponge and then added some gold Rub n’ Buff (available at craft stores) to give them some added bling. I coated both wings with Shellac to give them a beautiful sheen. I am thrilled with how they turned out and loved the simplicity of the homemade chalk paint recipe. I had some paint left over in my container, but I just tossed it because it wasn’t enough worth saving. You can store unused paint in a small airtight container, but I’m not sure how long homemade chalk paint keeps. If you are doing a large project, I recommend making small batches of paint so that your paint doesn’t dry out. 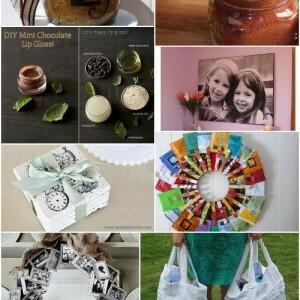 Have you used this recipe for homemade chalk paint before? Other recipes? What did you think? I am a Lowes Creator and was given a gift card to complete this project. All supplies came from Lowes (as did that gorgeous fresh cedar garland). All opinions are always my own, and if you know me well I have quite a few and am never scared to speak the truth :). Hi Mindy, I would just purchase a gray grout that you can mix with all colors. It will probably alter the color just a tad but not enough to be that noticeable. But if you are just doing an end table, I would recommend buying an $8 can of DecoArt chalk paint by Americana Decor. You can find it at most craft & Home Depot stores. One small can will cover a lot and you’ll probably save money. Love the mantle !! I’m guessing you made the candlesticks – What kind of paint?? And the ornaments – broken CD’s ????? And I love the background – slice of tree trunk !!!! Let me know what you think. The bag of unsanded grout is HUGE so it would be fun to go in on it with a friend to cut down cost and potential waste. I definitely like ASCP the best but in a pinch or to get a very specific color this recipe seems decent. Someone else in the comments recommended using calcium carbonate which sounded intriguing but can also be pricey. Thanks for stopping by girl! I remember meeting you at Haven :). 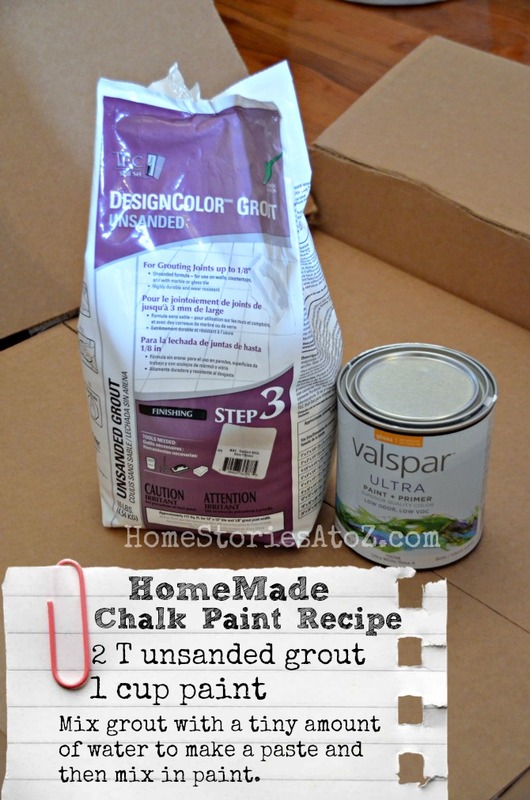 As unsanded grout may work for a DIY chalk paint you all must read the ingredients in it. 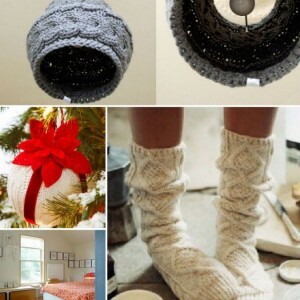 It sell on Etsy and they also have a great blog page check it out! Oh wow, thanks Heather! I hadn’t thought about the dust. Good point. I read online somewhere, that you can use baking soda in chalk paint. Have not tried it, but the article stated it worked. the wings are gorgeous! Hi Gena, I heard from Suzan that the baking soda doesn’t work well and is clumpy. It would be a cheaper more natural way to go though so if you try it and have luck let me know! That first pic is so pretty! (Even if its not finished yet!) And those wings…WOW! Spectacular! Not sure why this post gave me the thought for a mix your own paint store, but it did. And no, I won’t be opening one any time soon, I’ve been afraid to even try mixing my own chalk paint. Beth, your wings are amazing! I’ve been wanting angel wings for the longest time and must visit the local Marshall’s today. Hope they are there- you know how some stores cry different things…. I use calcium carbonate to mix up my “chalky” paint. The texture is so much smoother than when using grout or plaster of paris and I don’t need to add water to thin the latex paint, either. :-). Wish me luck on finding the wings! I’ve never heard of using calcium carbonate! That sounds fab. I wonder if you could dry out egg shells and then grind them in a coffee grinder to a fine powder. I might try it :). What are the proportions of calcium to paint? Picking some unsanded grout up tonight. I have a table to do….I don’t think I can stand it bright green any longer! Thanks for the uncomplicated recipe! You’ll have to show me your table post once finished Katie! Love them with that coat of white paint… so dreamy! Great job, Beth! I love these. When did you get them? I would love to but a set. Hi Paige! I just bought them last week at Marshall’s. Yes, I bought them at Marshall’s. In my Marshall’s they weren’t with the other homewares. They were in a middle section with other seasonal items and hanging up with the ornaments. Only $14.99. Absolutely!! Thanks for visiting me Shannon! the wings the entire look is fab, fab, fab! Very cute! 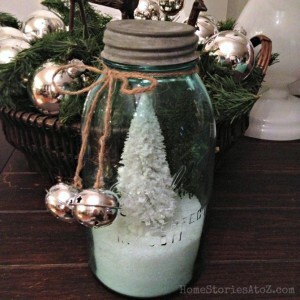 I have not tried chalk paint with Grout, just plaster of pairs. I will have to try it out. Thanks love! Thanks for visiting me too :). We don’t have time to visit blogs! LOL *wink*. Wow you work fast! We were just talking about these yesterday! They turned out exactly how I pictured them! I love the subtle touch of gold to. Pretty pretty! Gott get it DONE girl! Totally stressing because everything HAS to get done and photographed and posted this weekend. No idea how that is happening. I use the recipe with plaster of Paris and love it. I still use ASCP but when I am in a hurry and I don’t have any of the “good stuff” on hand, the homemade version works great. I haven’t tried that recipe yet. Do you like it better than the grout recipe Suzan?